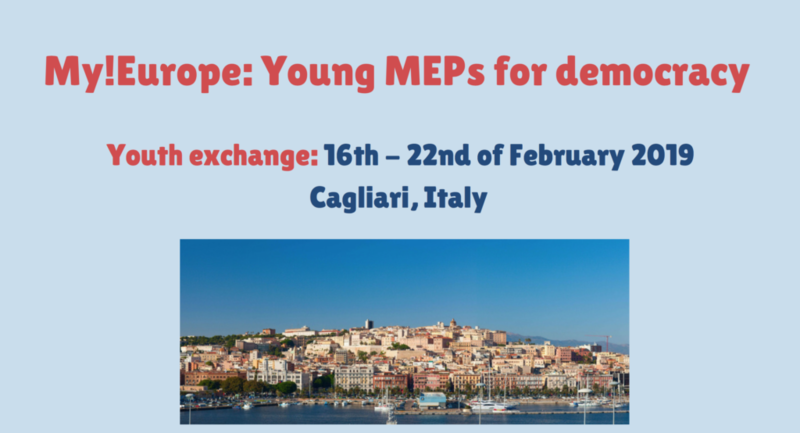 The Centre for European Progression is looking for young people interested in European affairs to participate in a week-long My!Europe – Young MEPs for Democracy Erasmus+ youth exchange programme, organised in partnership with the Cagliari-based Associazione TDM 2000 and other NGOs from across Europe. The exchange programme is organised as a simulation of real working sessions of the European Parliament and intended for young Europeans aged 20-24 (flexible). The aim of the exchange is to foster the participants’ understanding of EU policy-making and to encourage active democratic participation. The opportunity is particularly timely considering the upcoming European Parliament Elections in May 2019. – encourage interaction between young Europeans and the EU institutions promoting grassroots participation. The event is free-of-charge: Travel costs, accommodation (Hostel Marina) and catering (breakfast, lunch, dinner and two coffee breaks a day) are covered for the participants. To apply for the exchange programme, send us a short motivation letter introducing yourself in English (max. 200 words) to info@c4ep.eu by Friday 1 February. Please use the subtitle “My!Europe youth exchange application” in your email. Belgian citizens, as well as EU nationals and non-EU citizens legally residing in Belgium, are able to apply. If you require more information about the programme, please send your questions to info@c4ep.eu.